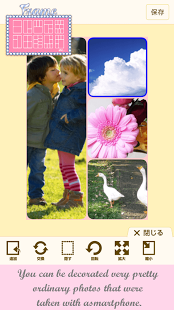 TOPIC is a photo editor that you can edit the photograph of the memory that have saved the album or taken by the camera. Easily, you can edit a photo with graffiti, stamp, filter (such as black and white or sepia) and frame, such as a text on image by this photo edting app. In addition, you can edit multiple photos in a processing the decorations by collage (cut, synthetic)!It is an important feature of TOPIC that you can photo editing in combination at a time multiple photos in a decoration. See below for more features. You can get pictures of the stylish atmosphere of a toy camera by simply editing the image that is covered with a filter to the photo. I have a number of filters to be able to enjoy fully, such as black and white or sepia. I will continue to add at any time the type of filter. We do not get bored because it from time to time update or available line-up of a number of stamp! We offers a wide line-up, “simple”, “fancy”, “girly”, “classic”, “Pop”, “makeover”, “balloon”, “message” and “season”. You can decoration with a roller 30 different by simple operation of just stroking your finger on the part to be processed! You will be determined freely even thickness, and you can edit the fashionable image at your fingertips! Let the graffiti free hand with a pen of about 50 kinds! You can choose the thickness from 4 pattern. We are going to present to a friend photos of only one in the world that I arranged to put the illustrations or put character in graffiti style! Let's save it carefully with the editing to put in a frame your precious photos with a frame of about 30 kinds of image you have put in the album! Type also increases still and frame favorite surely found. We offers a variety of font type, color, feel of a material character. 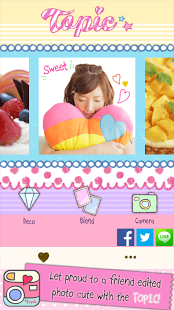 You can make a photo diary to put character, to present a photo with a message also is recommended. Let's put in the character that you think! 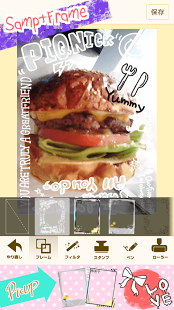 own by combining in combination with a cutout at will. Let's would appeal to photo manipulation for free to everyone in the blog! image of the icon and profile using the TOPIC! We plan to add more and more in the future free of charge function of the image processing collage, stamps, frames, and filter! Please look forward to the future of photo editor TOPIC!